The excitement of seeing wildlife is part of the experience of visiting the Grand Canyon Trail of Time and hiking along the Rim Trail. 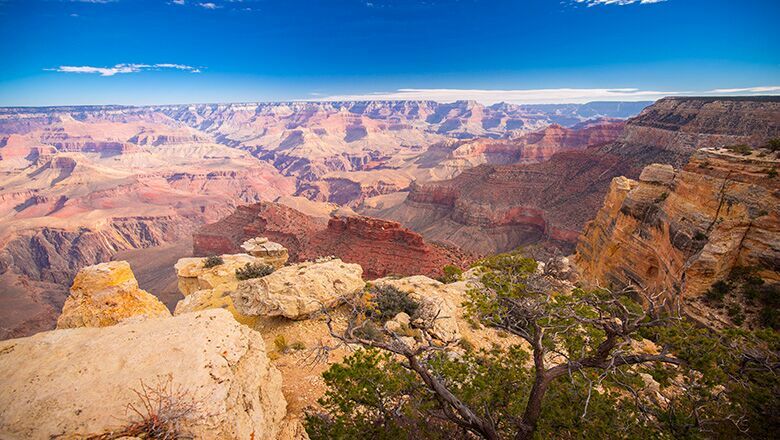 The Trail of Time forms an interactive path that showcases the geological history of the Grand Canyon. As you walk the shaded Rim Trail, you will also get to view various forms of wildlife – all indigenous to the Southwest. If you plan a South Rim tour to the Rim Trail and the Grand Canyon Trail of Time, you will also want to take note of the Grand Canyon wildlife in this area. Because the Canyon features a diverse landscape and elevation changes, you can see a number of wild animals in the park. However, you need to take precautions. Even if an animal looks harmless, it does not mean it won’t attack or bite. Keep this in mind, especially if you are traveling along a moderately easy path, such as the Rim Trail. Also, do not give any Grand Canyon wildlife food. Never approach wild animals or feed them. Park officials want animals in the park to depend on natural food sources, and not on human food. Because of the presence of animals, taking a path, such as the Grand Canyon Trail of Time, will make you feel like you’ve escaped to another time. The path’s name does not apply just to geology. Nearby trails will also give you the same feeling, as you can see a wide variety of mammals. For example, you can see a coyote scurrying through the Canyon just about anywhere in the park. Sometimes they appear at the tops of Canyon rims or near campsites. The lanky wild canines like to feast on carrion and rodents, and often forage through garbage bins inside of camps. The elk represents another Canyon animal. Elks resemble deer but are much larger and prominent. In fact, full-grown elks can weigh up to 1,000 pounds and measure 5 feet high at the shoulders. Bulls grow antlers each year while the female elks do not have this feature. That is how you can tell the two types of elk apart. Normally, elk reside inside forests, where they feed upon grass, especially inside the South Rim close to Grandview Point. You can also spot a mountain lion from time to time. These wild cats weigh as much as 200 pounds and can span as much as six feet in length. Lions prey on deer and elk in the park. At one time, the mountain lion was almost hunted to extinction. However, the animal has made a come-back, and usually is seen along the park’s North Rim. Reports about attacks are rare. However, it does not mean you should not play it safe and ask that a tour guide accompany you while walking park paths.